Polish Health Spa - discover exciting Poland with us! The tradition of Polish health spas dates back to the 13th century. Deposits of therapeutic mineral waters and therapeutic mud allow many disorders to be treated in Poland. Polish spas are not only for people with health problems, but also for those who seek peace and quiet for resting. All year round, more than 40 localities offer a gentle climate, picturesque landscapes, charming boarding houses, and modern sanatoriums as well as a high standard of treatment. The main proposal of Polish health spas are package treatments that include accommodation at sanatorium, board, medical care, and physiotherapy. Health resorts also offer excellent conditions for active recreation - biking routes, indoor swimming pools, and tourist routes for hiking. 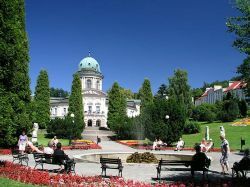 The extensive spa parks, which boast many rare plant species, also include pump rooms for drinking mineral water, and band shells. Famous names in Polish medicine work as diagnosticians in the health resorts. The medical facilities have been modernized and fitted with state-of-the-art medical and rehabilitation equipment. It is easy to combine a stay at a boarding house with treatment. The local spa services office will provide all the necessary information, and will refer patients to treatment facilities following consultation with a doctor.